The appearance of small red bumps, either in one particular area or all over the body, can happen to any of us. There are a number of reasons for this condition, including allergies and skin problems. Here, we’ll discuss red itchy bumps under the armpits: what may be causing them and what you can do for them. Some frequent causes of armpit itchy red bumps, the specific symptoms of each condition, and related treatment options are discussed below. Red bumps that may become blistered. Itchy skin that appears thick and cracked. Skin sensitivity due to scratching too much. Moisturize the affected area daily. Wear loose soft clothing so as not to irritate the skin. Avoid tight clothes and rough itchy fabrics. During baths and showers, use lukewarm water with mild soap or a non-soap cleanser. Gently pat yourself dry with a soft towel and try not to rub the skin. Lock-in moisture to the skin by applying moisturizer within three minutes of bathing. Don’t scratch as this can break the skin. Maintaining short fingernails may help. In dry and cold weather, use a humidifier to hydrate your skin. Avoid any sudden temperature changes. Wherever possible, steer clear of activities that make you sweat. Some eczema patients find that replacing carpets with floorboards or linoleum can relieve their symptoms. Pets can also provoke eczema, so give them regular dander treatments. Find out what exacerbates your eczema and avoid exposure to these triggers. Red, inflamed skin that may have an itchy or burning feeling. Clusters of white-headed or red spots around hair follicles. Blisters filled with pus, which eventually burst and crust over. A large swollen skin bump. Apply a warm, moist pad to the affected area. Over-the-counter antibiotics may clear up the infection. Use lotions, for example, over-the-counter hydrocortisone cream or oatmeal lotion, to soothe the irritation. Other pills and creams may control the infection and ease the inflammation associated with folliculitis, so speak to your pharmacist about them. Avoid shaving, or if necessary, use an electric razor. When you've finished, wash the skin with warm water and apply lots of moisturizer. Gently wash the affected area with antibacterial soap twice daily. The development of an allergic reaction because of expose the skin to certain substances is known as allergic contact dermatitis. Upon contact, the body releases inflammatory chemicals, resulting in an oozing, red, swollen skin rash, with an itchy, irritated or burning feeling. Common substances known to provoke allergic contact dermatitis include latex, metals found in jewelry (e.g. gold or nickel), chemicals in cosmetic and skincare products, poison oak and poison ivy. Isolate the cause of your dermatitis and avoid contact with it. Remove any possible irritants from your skin by rinsing with mild soap and warm water. If you do feel irritation, try not to scratch the rash, as this can cause further infection. Calamine lotion and hydrocortisone creams can ease itching. Antihistamines, such as diphenhydramine, may reduce the symptoms. Erythrasma is a chronic skin infection caused by Corynebacterium minutissimum bacteria. It most frequently occurs in warm, moist areas, such as the armpits, groin, and other skin folds. The main sign of erythrasma is the appearance of red-brown scaly spots with well-defined edges. These patches may be slightly itchy. You can treat erythrasma with topical antiseptic and antibiotic creams, such as Whitfield ointment, lotions containing fusidic acid or clindamycin. With more widespread infection, oral antibiotics, such as erythromycin or tetracycline, may be required. The erythrasma should then clear up fairly quickly. To prevent recurrence, antibiotic soap can be used. Some patients are also treated with photodynamic therapy, using broadband red light with a peak at 635 nm. Hidradenitis suppurativa is a chronic, long-term ailment with no known cause. It occurs when areas of the skin rich in apocrine sweat glands become inflamed, resulting in painful recurrent abscesses and boils. The first sign of hidradenitis suppurativa is usually the emergence of a single firm, raised, inflamed lump on the skin that is similar to a boil and may become itchy. Cut back on your exposure to heat, and activities that lead to sweating like intense exercise. If you have armpit bumps, avoid underarm deodorants and antiperspirants, which can irritate the skin. Don’t apply any perfumed products to the area. Any increase in redness or soreness. 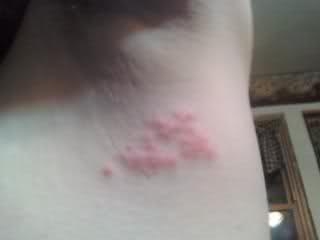 A rash over a large area of the body. A rash that doesn’t improve over time. The absence of hair growth in the affected area. The development of further symptoms, such as fever. If you suspect that the bumps may be caused by an allergy. If the symptoms are not relieved with over-the-counter medication.